Yes, that's right. 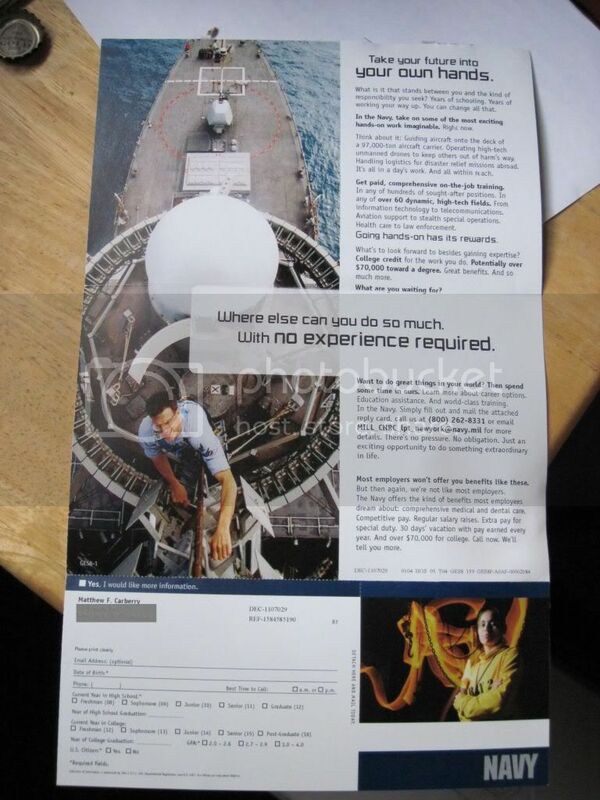 The United States Navy was making a pitch to me. I'm betting this isn't the direct product of a human mind; it was probably a computer that plopped my name into a mailing list and caused this to be sent to me. But it's clearly evident that a breakdown has occurred somewhere. There is, as anyone who is still reading this will clearly know, one rather large issue with this piece of correspondence. Though it's only one problem, I feel compelled to use several different phrases to describe it: I've already been a part of a global force for good. I've already accelerated my life more than I'd like to remember, and sometimes I felt like it was accelerating in the opposite direction as I wanted it to go. I let the journey begin...and six years later, having experienced that journey fully and richly, I allowed it to end. Both I and the Navy went full speed ahead. I think we get the picture; besides, that's as many slogans as I can remember right now. The most ironic thing is that I'm not surprised in the least by this. One might be inclined to think that a high level of foolishness would be required to do something like this, and could the Navy really be this stupid? As a veteran of the Seagoing Military Force, I can affirm that the answer is "yes." Yes, the Navy absolutely is capable of being that stupid. But that is, for the most part, thankfully behind me now.